Book Review: The Alice Network by Kate Quinn – B00KS in Paradise! The Alice Network is a fantastic read! One of my favorite books that I have read so far this year and one of my favorites in historical fiction! The Alice Network follows two women post WWII who couldn’t be more different. Charlie St. Cloud a rich, smart, unwed, and pregnant American travels to Europe to have her “Little Problem” taken care of. Along the way, all she can think about is her missing cousin, Rose. Rose disappeared in Nazi-occupied France during WWII and Charlie is the only one who holds out hope that she’s alive. Determined to find out what happened to Rose, Charlie runs away to London and is set on a course that will change her life forever. Eve Gardiner a recluse, drunk, and haunted by a betrayal that destroyed her life in WWI. Eve was burning to join the Great War and had no hesitation when she was recruited to work as a spy. She’s sent to enemy-occupied France where she’ trained by the “Queen of Spies” and head of the Alice Network, Lili or code name Alice. There Eve learns everything she can to help her country and her friends in this time of great violence. The two of them are intertwined forever when Charlie knocks on Eve’s door one cold rainy night asking for a name that she hasn’t heard of in years. Together they will travel across France searching for the truth no matter where it leads them! WOW!! I knew I’d like The Alice Network, but I didn’t think I was going to LOVE it! The story is told in alternating narrations between Eve and Charlie, one during the Great War and one post-WWII. Each has an entirely different view of life, but both women are incredibly strong and complex characters. One of the reasons I enjoyed The Alice Network so much is because you’re taken through their pasts and see what events made these women who they are today. The writing was beautiful, and the depth of the characters was on point. The plotline made me breeze through the book, and as I got closer to the end, I couldn’t put it down. Kate Quinn was also able to weave women’s rights into the novel beautifully. The issue of women’s choice, contraception, and self-worth were issues that were brought up throughout the book. However, it was never to the point where it was getting annoying or distasteful. 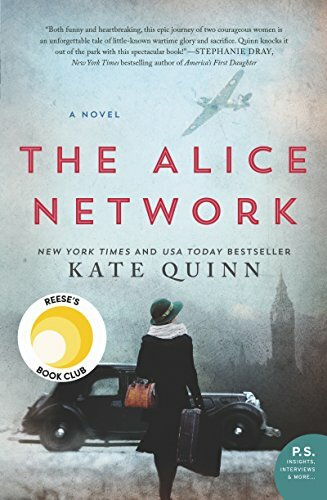 The Alice Network has excellent, and loveable characters, a little mystery that takes the troupe across France, and a network of female spies what more could you want in a strong female-led historical fiction novel! Pick it up! This is a must-read, and I cannot stop gushing about it! This is the first novel I have read by Kate Quinn, and it has definitely convinced me I need to read more of her books!